Polyurethane Spray Foam is the solution for all your insulation needs. It is a seamless, “spray-in-place” insulation that is low density, rigid, closed-cell, plastic foam. It has the most efficient insulating properties available. It comprises of a 90% closed cell formation, thus drastically reducing the chances of water absorption or transmission. Polyurethane has tremendous thermal properties. 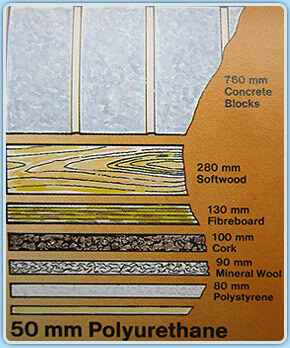 Our closed cell foam has an R value of 1.23 per 25mm making it the most efficient insulation for residential housing . We prefer to use only closed-cell foam as it has the highest R-value, lowest perm rating for water vapor transmission, and adds structural integrity as well as soundproofing. Not all spray foams provide these benefits. We can also offer open cell foam which has a R value of .6 per 25mm. It will insulate and air-seal but has not got the same water resistance as closed cell Foam and needs to be applied thicker to achieve the same R value. Excellent acoustic and vibration resistant properties. Resistant to most chemicals, particularly hydrocarbons and solvents. There is no better home insulating material that can seal your home from air and moisture intrusion, save on costly utility bills, strengthen your home, and protect your health from dangerous mold than SPF home insulation. Polyurethane Foam is used in most ice coolers due to its superior thermal insulation properties. It is also used for creating the panels used in industrial coolstores. Polyurethane Foam helps the cold stay cold, and warm stay warm. Polyurethane Foam is used in numerous marine applications. The high strength to weight ratio plus its excellent buoyancy properties makes it an excellent choice as an integral part of the manufacture of boats, buoys, docks, and flotation devices.